quality shelf-life of 9 to 12 months. Blanch at 212° for 60 seconds in a 2% salt brine (1.5 ounces, or roughly 1/2 cup, of non-iodized salt or sea salt to 2 quarts of water). Chill after blanching in cold running water or in a tub with a mixture of 50% water to 50% ice. Following a 15-20 minute chill, remove excess surface water. Place in second freezer bag or over-wrap with a laminated freezer wrap. Freeze at -18° C (0° F) or lower -- standard for home refrigerator/freezer units. Store frozen at -18° C (0° F) or lower. The lower the storage temperature, the better the lobster meat quality will be maintained. Lobsters should be thawed overnight in the refrigerator. Thawed lobsters should be boiled in a 2% salt brine for 12-15 minutes. Remove claws and tails from blanched lobsters. Continue with steps 5 through 8 above. 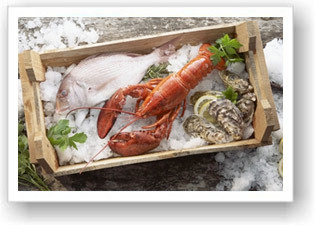 How to Prepare and Freeze Picked Tail and Claw Meat: Lobster meat that has been picked and frozen will have an acceptable shelf life of 3-6 months if stored at temperatures of 0° F (-18° C) or lower. Follow steps 1 through 4 for freezing whole lobster. Remove tail and claw meat from the shell. Continue with steps 7 through 8 for freezing whole lobster. Thaw meat in refrigerator overnight. Prepare meat by steaming for 8 to 10 minutes in a colander above a steaming pot of water.